Santa Monica’s Commission on the Status of Women says it’s dedicated to exploring “policy and issues relevant to women and girls…” Emails recently obtained through a public records request suggest the Commission’s members have added a new mission to their portfolio: Advancing “policy and issues” relevant to Unite Here Local 11. 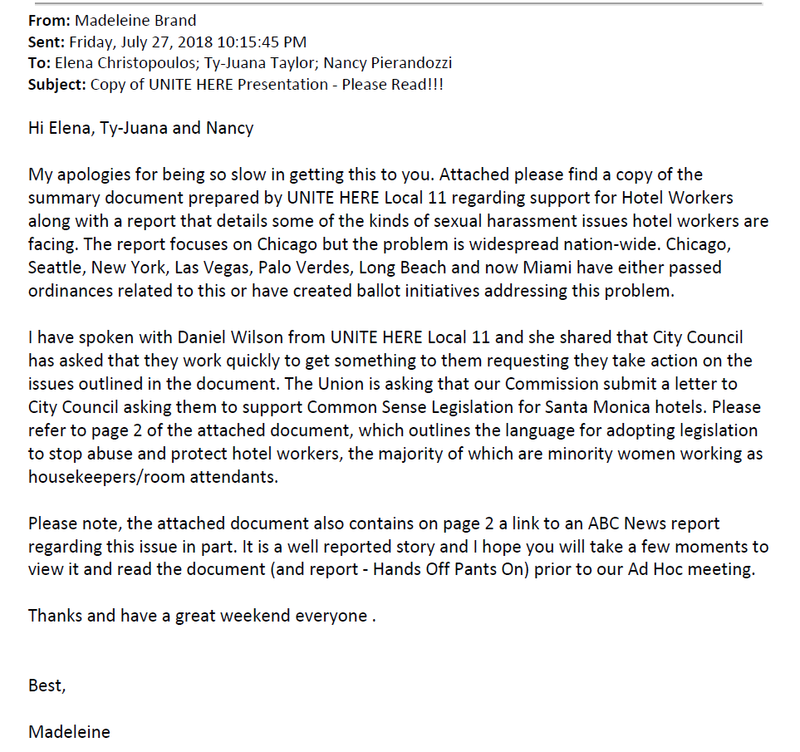 Earlier this year, the union filed an unusual lobbying disclosure with the city regarding a “hotel housekeeper protection policy.” Local 11 has pushed for similar measures in Long Beach and Rancho Palos Verdes; in Santa Monica, however, their lobbying targets for this policy package were members of the city’s Women’s Commission. The emails reveal the nature of the union’s lobbying. Local 11’s Danielle Wilson parlayed a meeting with Commission Chair Sylvia Ghazarian into an extended presentation before the full Commission. Wilson laid out the union’s three demands for “hotel housekeeper protection” legislation in a memo to the Commission, which included the required use of “panic buttons” for housekeepers, and controversial restrictions on how and when hotel employers can schedule their employees. Why go to the Commission rather than the Council? Following the outrage over Local 11’s proposed “labor peace” policy, the Council likely had no desire to demonstrate further favoritism for its friends at the union. So they came up with a clever idea: Use the Women’s Commission to surface the proposal. 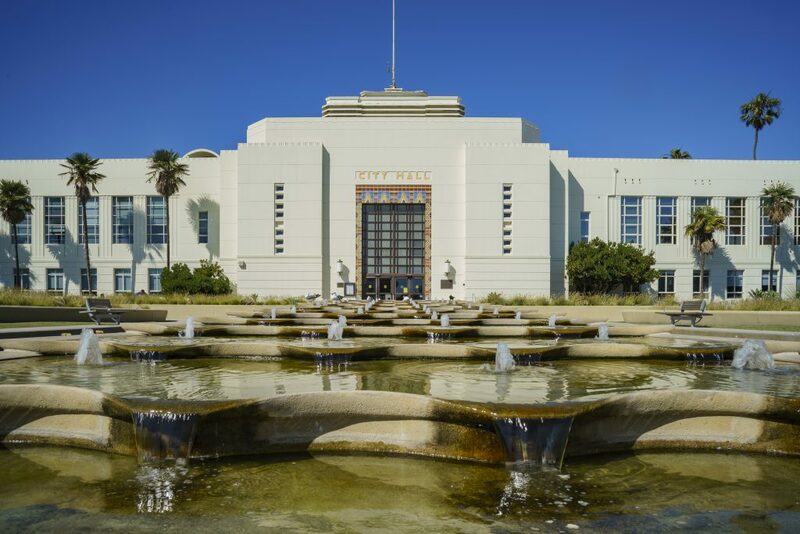 It’s a remarkable admission rendered even more so by the fact that the Commission has produced no original research on whether the “solutions” proposed by Local 11 and the Council make sense for Santa Monica. The basis for this legislation are findings from a single union-funded report Hands Off Pants On, funded by UNITE Here Local 1 and based on survey results from 500 workers at Chicago hotels and casinos. This isn’t local democracy; it’s local legislators, unions, and appointed officials attempting to avoid sunlight on a potentially-harmful idea. Unfortunately, it’s what residents have come to expect in Santa Monica.